This premium, durable bucket hat is made of 100% heavyweight brushed cotton twill. Twill fabric treatment gives the unstructured hat a slightly broken-in feel for a comfortable, relaxed fit. Features two brass eyelets on each side for ventilation and a classic look. Available in four colors: pink, aqua, yellow and blue. 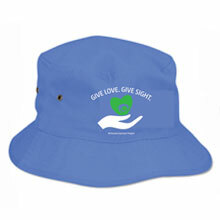 A Bucket Hat is a chic apparel accessory for men and women and a great accent piece for any wardrobe.